A couple of years ago I made a quilt for some friends who had recently become foster parents to a sweet baby named Nadia. I really loved the quilt and had enjoyed the process of making it; a process I kind of made up and wasn’t sure was going to work, but decided to go for it anyway. Since then, I have been asked by different readers/friends if I will ever put together a tutorial for it. Well I finally decided to do just that! Here is my most recent quilt (sans binding) created using this same method. This is my Comfort and Joy Circle Quilt and really was a joy to create! I hope you find the following helpful. I’ll be showing photos of the same process during the making of both of the above quilts, just in case you’re wondering when you see the photos. *Small amounts of yardage, scraps, ect. Enough to trace varying sizes of circles. *3 or 4 different sized cirles to trace- plates, bowls, cups, etc. *A large piece of linen large enough to be the background or main piece for your quilt- I chose to use linen for this type of quilt because I really like linen and because it’s size (55 in wide) allows me to not have to piece a background together. I love this Antwerp linen from Superbuzzy! For the main portion, (the circles) of this method, I used Krista’s Crop Circle method . 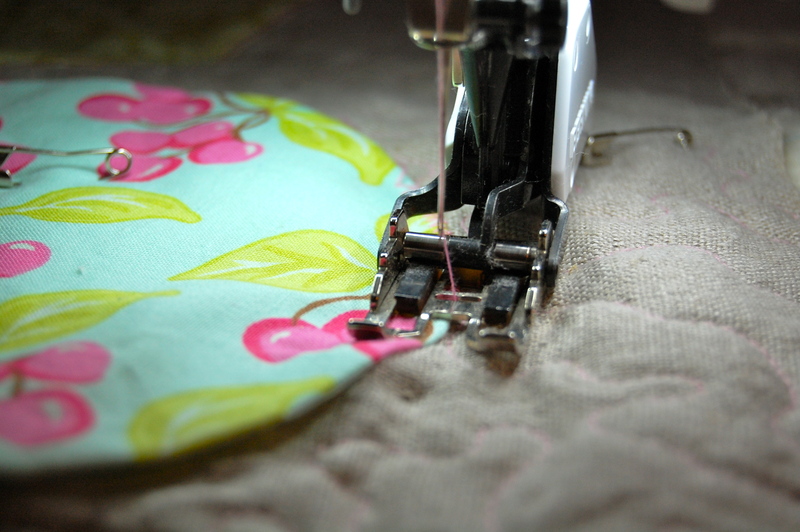 This is a great tutorial and is where I got the start of the idea for this quilt. Please refer to her circle making technique as I will not re-explain it here! Begin creating some circles, how many will depend on personal design preference and the size of your background fabric. I think I started with around 10 to 12 here and decided quickly that I wanted more. Then, you are ready for the fun part, deciding on a layout. Obviously, for this you are on your own and there are tons of possibilities. Your linen is your canvas in a way! I take all the different size circles, lay them out on my linen, then decide if I want more or less. This step is more or less to get a sense of how many circles you want. After deciding on a general layout and making the appropriate number of circles, you could snap some photos to refer back to when you’re ready to adhere them to your background fabric. Next you layout your backing fabric for the quilt, the batting and the linen background fabric without the circles attached and make a standard quilt sandwich. Here you need to smooth out the top linen as much as possible and pin the corners/edges (sorry I forgot photos of this step). The linen can be a little tricky to work with as it tends to shift. I like to have it as “stable” as possible before ironing on my circles. Then, referring back to your photo, or just winging it, you can lay out your circles in the placement that you like. Here is where you will commit to the layout by ironing your circles in place. Don’t worry this will not make your quilt stiff on the circles, as long as you use the lightweight fusible you’re fine. Then it’s time to baste the whole thing. I use a LOT of pins here because the linen continues to be a bit “shifty”. Some may like to use spray basting here, I have not tried that however. Next, it’s time to start quilting!!! I have chosen to stipple here, which I love because it’s fun and goes pretty fast. The tricky part where I need to slow down is in between the circles. I try to smooth the linen out as much as possible as I move through the quilt, but I have also learned to expect a sort of puffy look. Once you finish all the stippling, or whatever you decide to guilt in the negative space here, you are then ready for the hardest part. That’s right, we saved the best for last!! Here I switch to my walking foot and a zig-zag stitch and manuever the quilt through the machine to stitch around each circle on the quilt. For this step, I take it nice and slow, being sure to stop often, with my needle down in order to turn the quilt/work it through the throat of my machine, and still keep a smooth line around my circle. The key word here is GRADUAL, my advice is to take your time and stop often to make sure the center marking on your presser foot is lined up with the edge of your circle. 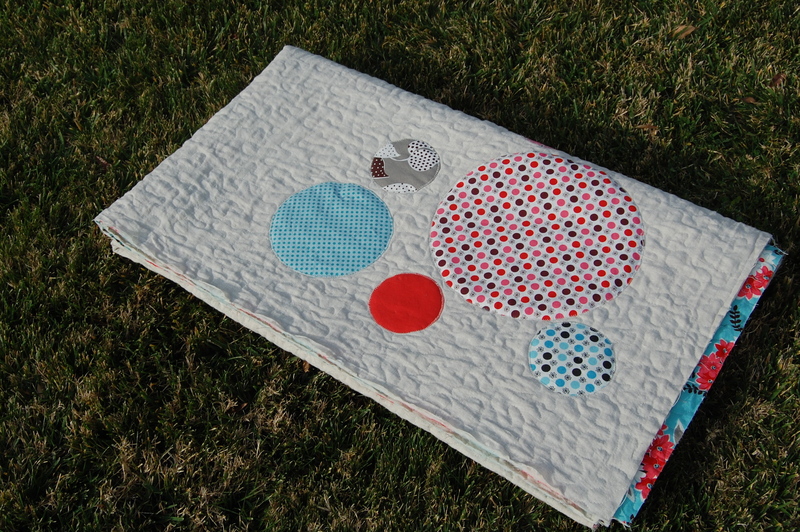 Once you’ve stitched around all your circles, you are ready to bind your quilt! 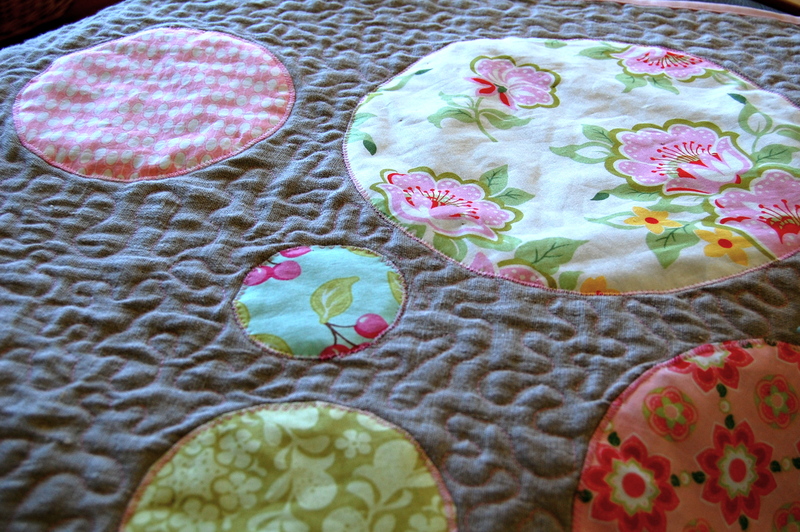 One thing to know about your circles is that they will end up being puffy as only the edges are stitched down. This was, for some reason, a surprise to me when I first made the quilt, not sure what I thought they would do……? 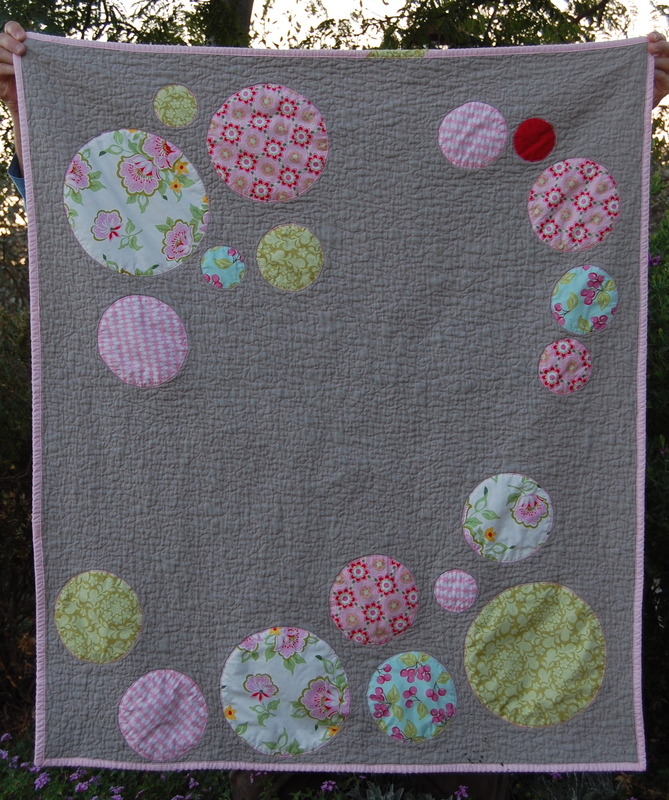 I have not tried to quilt the inner part of the circles with this method in order to create a different look, but I imagine it could be done. 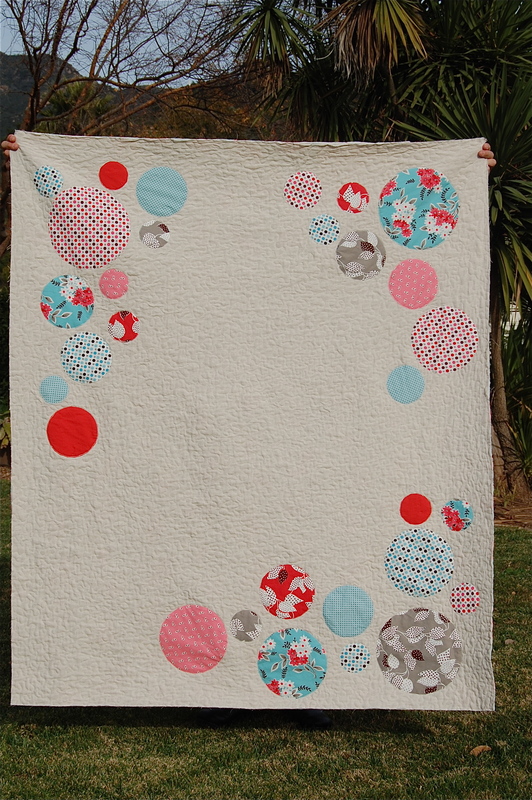 This sort of “puffy” look has grown on me and I expect it on this type of quilt. For my second attempt at this method I chose to make my largest circle a bit smaller (about 9 to 10 inches) than on the first version, which makes the surface area of unquilted space smaller– if that matters to you! I hope, if you give this a try, you’ll find it as fun as I did. Please let me know if you have any questions or comments about this tutorial. Many thanks to Krista Hennebury at Poppyprint for her great circle making method and generosity in letting me include it in this tutorial!